Get well wishes are extended to Haiden Fullmer, MargiBeth Miller, John Piseski and Celene Schuder. My condolences are extended to the family and friends of Sylvia A. Dremers House, Shirley A Schryver Readman and William H Sweatland, class of 1948. American Legion Post 601 Raises more than $1,900 for Pleasant Lawn & Bidwell Cemetery Associations. The chicken BBQ was a huge success. It officially started at noon and was sold out by 12:30 p.m.
145 chickens and three tables filled with baked goods were sold. The Bidwell and Pleasant Lawn Associations can’t thank The American Legion Post 601 Family enough for all they did for us today. 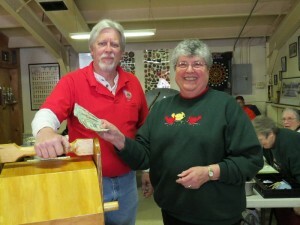 Eleanor Kinney won the 50/50 drawing and donated back the winnings. 50/50 drawing: Richard Palmer, commander, Russell Horning American Legion Post 601 and Eleanor Kinney (winner of the 50/50 drawing). Our thanks go out to all of the the people that showed up, the wonderful Ladies of the Auxiliary, to those that donated baked goods, to the generous people that made monetary donations, Bernie Horning and his crew that cooked those wonderful chickens and side dishes and to Commander Richard Palmer and the American Legion Family of Parish, New York. Bidwell and Pleasant Lawn Association. I heard from Margibeth Miller recently, she has had a full knee replacement and is home enduring regular therapy and hopes to be in running condition shortly. The Parish Volunteer Fire Company will host an open house on April 27 and 28 from 8 a.m. – 3 p.m. at the fire station, 16 Union St. They will also hold another delicious All You Can Eat pancake breakfast on April 28 from 8:30 – 11 a.m.
Prices: Family – $22; Adults – $7; Seniors – $6; Children (4-12)-$4.50; 3 and under-free. B. Gale Mullen was contacted by LouAnne Stone on behalf of Orwell Old Home Days, June 7, 8 and 9. She is looking for people who want to be vendors on June 8 as part of a three-day festival, for a fee of $10 per space. Non-profit organizations are welcome at no charge. The deadline is June 1 and Mrs. Stone can be reached by mail at 7462 S. State St., #3, Lowville, NY 13367, or by phone at (315) 376-6749. While this schedule is tentative, lots of activities are planned in the Park on Saturday, which will draw a crowd. Our craftspeople would benefit from that. Hope someone can use this information. As far as spring arriving in a flurry of snow, all is not lost. We have seen a large flock of snow geese headed north on March 24, blue jays, starlings and downey woodpeckers are active, and Lucky Larry, the “resident” raccoon comes down from his pine tree almost every night to chow down at Earl Gray Cat’s bowl. Canada geese have been seen in the local meadows, but they may be “local boys” rather than migrants. Hungry deer pass through our lot on the way to better pickings, and a flock of buzzards over Easy Street on Monday the 25th certainly heralded the annual migrations over Derby Hill and the east end of Lake Ontario. Naturally, the red and gray squirrels are still numerous at Skunk Meadows and the flying squirrels are back at the feeders at night. State Senator Patty Ritchie honored 17 Central and Northern New York women at her 48th Senate District “Women of Distinction” ceremony, held in Watertown on Thursday. Those recognized were nominated by friends, family and community leaders in Oswego, St. Lawrence and Jefferson counties. Parish had two nominees this year! Congratulations to Sandy Mensch and Clara Sterio!! Thank you ladies for all that you do and have done! The Parish Senior Club is currently collecting bottles and cans to benefit the Dr. William E. Merrill Parish Town Park. If you have cans to donate and would like them picked up please call 625-4617 or you may drop them off at the Country Can Return, 3378 State Route 69 in Colosse and place on the Parish Senior Club account. The New Hope Presbyterian Church, 814 Rider St., will be the Oswego County collection site for Church World Service kits on April 24 and 26 from 11 a.m. – 1 p.m.
CWS provides CWS School Kits, Hygiene Kits, Baby Care Kits, and Emergency Cleanup Buckets. Or, you may call New Hope Presbyterian Church for details at 625-4304. Cash donations in lieu of assembled kits also help provide much-needed supplies. The Greater Parish Area Chamber of Commerce will hold a regular monthly meeting on April 25 beginning at 7 p.m. at the Parish Public Library, 3 Church St.
On May 2 the chamber will host a “Business After Hours and Networking Social” from 6-9 pm at Mills and Petrie Memorial Gymnasium. Stop in learn more about the happenings. New Hope Presbyterian Church will host another Red Cross Community Blood drive at the Parish Fire Station, 16 Union St., on May 4 from 8 a.m. through 1 p.m. Call Mary Lou at 289-2391 or email [email protected] to schedule an appointment. Walk-ins are very welcome as well. The Oswego Valley Chapter of the Barbershop Harmony Society will host The Hurricane Boys Con Brio and The Oswego Valley Snowbelters Chorus on May 4 from 2:01 – 7:31 p.m. at the Hall Newman Center, 36 New St., Oswego. On May 8 at 7 p.m., Chad Miller, an accomplished fiddler and a member of the NYS Old-Time Fiddler’s Association in Osceola, will perform a free concert of Old-Time Fiddle Music at the Gazebo Park area located at the four corners in Parish. His program will consist of selections of New York/Canadian style fiddling, some Scottish and Irish tunes and old-time area favorites. Bring a lawn chair and your toe-tapping shoes. Great family event. Tell your friends and neighbors to join us for this fun-filled evening. This public concert is being sponsored by the Parish Town Historical Society. In case of rain the concert will be held in the Mills and Petrie Memorial Gymnasium, 2938 E. Main St.
For further information call 447-1211. So much going on in Parish — get involved. On May 9 a public hearing will be held at the Mills and Petrie Memorial Gymnasium on New Visions franchise agreement followed by an informational presentation on natural gas to be held at the Parish Fire Station, 16 Union St.
On May 18 the Parish Post Office will be collecting nonperishable food items for the Parish Ecumenical Food Pantry. Cheri Stooks took on such an interesting endeavor that benefits Parish in a multiple of ways: restoring an empty building and bringing a new business into Parish. This grand building has had been a theatre and a Catholic Church and Cheri has been renovating for more than a year and it has evolved into the Parish Antiques and Country Market, 2978 W. Main St. The grand opening will take place on May 18. Kudos Cheri, family and friends. The Parish Community Yard Sale will be held on May 25. You may call Chriss Sackett at 625-4619 or email [email protected] to get placed on the map. Be aware that the Parish village and town clean up held on Dill Pickle Alley will be taking place soon. I will post the date as soon as it is set. Better Late Than Never APW Class of ’82 Class Reunion: July 19 at 6:30 p.m. Location: Happy Valley Inn, Route 69, West Amboy. Buy your own food and drinks. Dance or sway to 1980s music performed by a live band! To make this column interesting and informative, we need to hear from you. Email informtion to [email protected] or call 289-2391.